So perhaps someone asked you the question “What is Pompeii?” and you weren’t sure how to answer. Maybe you’ve seen the film? Maybe you’re completely clueless but for one reason or another you have found yourself here. Not to worry. 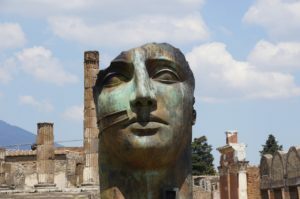 In this article we will take a run though the basics of what Pompeii is, why it is famous, what happened to it, and a whole lot more. Remember, if you’re thinking of taking a trip to visit Pompeii, be sure to check out our main page for information on ticket prices, opening times and everything else you might need. Don’t forget to downloading the Discover Pompeii app as well for your journey around the ruins of this ancient city. So what is Pompeii? Let’s take a look! Pompeii’s origin story is a debatable topic to this day. Depending on which historic school of thought you prescribe to, there seem to be two main sides. Some historians believe that the Osci (Italic people) founded the ancient city. The Osci arrived in the area between 700BC and 600BC. The other side of this argument would say that the Ancient Greeks settled into the area that became Pompeii sometime between 800BC and 700BC. There is now evidence that bronze-age settlements existed there before Pompeii. So what happened to them? Good question! In order to answer that, I should mention that Pompeii is about 6.4 miles (10.3km) from an active volcano: The infamous Mount Vesuvius! What is Pompeii? It’s a sad moment in history. If you have not heard of this volcano before, not to worry. This volcano is part of what makes Pompeii so well known today. Fun fact: There was not a word for volcano until after Vesuvius erupted in 79AD. (You can fine more interesting facts related to this on our ‘Creepy Facts’ article).You may be wondering why in the world anyone would want to live near a hill with such destructive power. As I mentioned, volcanoes were unknown to settlers of this time. There are benefits though. The area is rich in minerals and has incredibly fertile soil. The mineral-rich water can lead to sulphur build-ups that could be collected and sold in order to push trade in the city, improving the economy. Combine this with the high fluoride content of the water and air and you have a great place to start a town or city. It is a lesser-known fact that Pompeii and its surrounding towns were popular tourist destinations. Upper class citizens from all over Italy (especially Rome) would travel to Pompeii as a holiday retreat. Even Emperor Nero himself used to visit! You had spas, sun, sea, wine, all the health benefits, even the odd brothel or two…it was no wonder that it became such a popular option. Roman technological advancement was at its peak in this area: early boilers have been excavated in Pompeii’s ruins (spoiler alert). Pompeii itself was also a port, which made fishing and trading that bit easier. Therefore, it is not difficult to see why the city soon flourished here. What is Pompeii? Sadly, it’s one of the victims of Vesuvius. After being damaged by an Earthquake a few months previously, Vesuvius started acting up. Nowadays, we know the early warning signs of a volcanic eruption but back in 79AD, people were unaware. On August 24th 79AD Vesuvius’s wrath was unleashed upon the surrounding towns and cities. An almighty eruption with about 100,000 times the thermal energy of the bomb dropped on Hiroshima took place. Lava travelling at huge speeds engulfed Pompeii. Air temperatures of the area reached 300⁰C. Ash and debris poured out of Vesuvius for over 24 hours and buried the city in 6ft of debris. As many as 2000 settlers were killed that day. Towns and cities were buried and lost to the world for centuries. Visit our ‘creepy facts’ article to learn more about the eruption and to read a section of an eye-witness’s account of the event. Fast-forward to the year 1748 and we have the rediscovery of Pompeii. You may be wondering why it took so long for a popular city to be found. The reason for this is actually quite simple. As Pompeii was known as a port, those searching for it looked on the coast. Unbeknown to them, the eruption had added miles of coast that hadn’t existed. This gave the appearance of Pompeii now being a few miles inland. As the site was excavated (as it still is to this day), it was discovered that the way in which these people died was also the cause of their preservation. Ash had clung to their skin, creating a cocoon of sorts which held their shape. Filling these cavities with mould-material allowed a cast to be made of the victims of Vesuvius. If you visit the site today, you are basically seeing Pompeii how it was on that fateful day of August 24th 79AD. You can walk around the ruins and see a snapshot of what life may have been like for people living in those times. Sit in the theatre area, visit the spas, step into the houses, walk the streets and follow the not so subtle directions to the brothel. You can also walk up Vesuvius and get a look at the distance that was covered by its volcanic debris in a matter of seconds. Of course you can get a closer look at the bodies left behind which adds to the atmosphere of this ancient city. Before you visit Pompeii, be sure to check out our visitors guide to get all the information you need. So what is Pompeii? It’s the closest we’ll get to time travel. What is Pompeii? It is the city frozen by fire. Vesuvius’s mighty wrath reigned down upon this innocent city and its inhabitants. As tragic as this is, it allows us to see history in a way we can’t do with any other historic site. Where else can you see the immortalised souls who once lived there, whose last moments have been captured by Mother Nature? I couldn’t recommend Pompeii enough to you and I can guarantee that the entire experience is an unforgettable one. For a more in-depth guide, download the Discover Pompeii app. You can then access over 6 hours of audio guide material. The offline GPS maps are useful for navigating around the vast ruins and can guide you to places to eat. I hope this article has been useful. Hopefully now if somebody asks you “What is Pompeii?” you will have an answer.